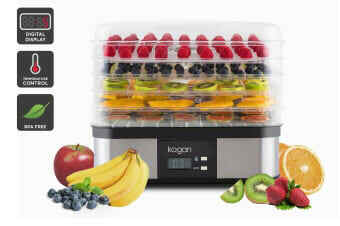 Save space, extend shelf life and get more from your food with this electric food dehydrator. Preserve food in an easier and healthier way! 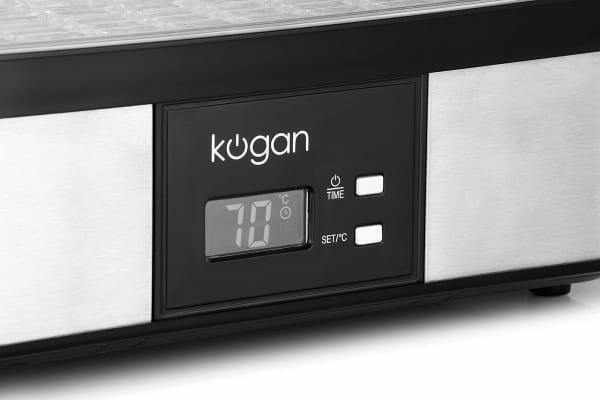 The easy to adjust temperature settings on the LCD display makes child’s play out of dehydrating foodstuff! Unlike canned food, dehydrated food has no added sugar, so go ahead and preserve different foods including fruits, vegetables, nuts, herbs and more the healthier way. The Kogan food dehydrator lets you do more with not just one or two, but 5 drying trays! You’ll find yourself reaching for this handy appliance whether you’re making a large batch of crunchy snacks, or are dehydrating multiple fruits and vegetables at the same time. Made from durable transparent plastic, this appliance lets you track the progress of your food at one easy glance.